Honey, bee pollen, propolis and royal jelly have serious health benefits that are not to be taken easily. It’s not uncommon for farmers or beekeepers to live well over ninety and be mistaken for twenty years younger. Royal Jelly is secreted form the heads of the worker bees, and is used to feed all the larvae. After a few days, only a few bees are still fed the Royal Jelly. These bees develop into queens. The Royal Jelly creates a ‘super bee’, speeding up growth and metabolism of the designated queen bees fed with this substance, as well as prolonging the lifespan of the bees who are continuously fed royal jelly. This substance is presumed to have similar health effects on the human body, acting as a natural preserver and enhancer. Bee pollen comes from pollen that the bee collects from flowers, and in its purest form may also contain bee saliva. This pollen contains concentrated vitamins, minerals, carbohydrates, lipids and proteins. 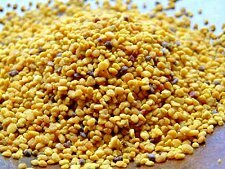 Bee pollen is used as a general health enhancer, curing everything from alcoholism to allergies to sexual performance and heightening immune strength. On our last trip to Romania we learned that these three bee byproducts taken in combination with honey have been used for centuries to improve health, strengthen the immune system and increase average lifespan. These products can be found at most health stores however we recommend finding a local bee keeper and purchasing directly from the source, as many store-bought products are diluted or not as natural as they claim. Take your favourite organic un-pasturized honey and mix in 3tbsp of pollen, 3tbsp propolis and 1tsp royal jelly. Take as frequently as desired.